The next European Council can bring important decisions on the British question. So said Jonathan Faull, Director-General of the Commission's task force related to the UK referendum and its membership in the EU. 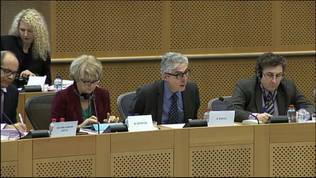 He appeared for a hearing in the European Parliament’s Constitutional Affairs committee on Thursday (January 14), in order to inform MEPs how far have the negotiations gotten. According to him, at this stage, it is still in the realm of guesswork to say what the result will be from the EU summit on February 18-19 in Brussels, when the main topic will be the four “baskets” with demands of the British PM, formulated in a letter to the member states in November and discussed for the first time at the December European Council, as euinside reported. Expectations for a possible agreement are considerably higher for February, he said, but recommended not betting on it. The only thing certain so far is that the political will for solving the problem is very strong. Beyond political will, however, almost everything else is shrouded in total uncertainty. Starting from the question what form will the eventual agreement have – a declaration, a statement, or an intergovernmental agreement. At this stage it is clear that the British PM insists that the decision, whatever it is, is of a legally binding character, which only requires that the leaders agree on a draft of conclusions. Jonathan Faull thinks that many of the demands of Great Britain could be met without amendments to the founding treaties of the EU, including the most controversial basket, which concerns social benefits for workers from EU member states. The EU treaty and secondary legislation include rules, which define the circumstances for free movement of labour force and the EC is of the opinion that the current legal framework contains enough flexibility in order to address Great Britain’s concerns, whose social system is not a contributory one, meaning benefits can be received without having to have contributed to the system. During the negotiations it was never suggested that the UK changed its system. “That is the way the British social security system operates and I don’t think anybody is suggesting that turning it on its head is in any way plausible or necessary to deal with this issue. We take the system as it is”, explained Mr Faull. At the moment, there is a reform of the British law underway, which aims to implement a restriction of four years of residence before the right to social benefits is granted. This restriction is seen as being too long by most member states from the eastern part of the EU. German MEP Sylvia-Yvonne Kaufmann (Socialists and Democrats) shared strong concern that regardless of what is negotiated, it will not be the subject of the referendum. A similar question was asked by MEP Ramón Jáuregui Atondo (Socialists and Democrats, Spain). There is talk of an agreement of an irreversible character, which is good if Great Britain stays in, but if it decides to leave the reform will be pointless. Jonathan Faull replied to this in brief: “The referendum is a matter for the British people”. It became clear from the reply to the Spanish MEP’s question that the EC has no plan B what could be done if Great Britain actually exited. “EC is working to keep UK in EU and without interfering in any way”. Several MEPs raised the question of a possible domino-effect after the British referendum. Enrique Guerrero Salom (Socialists and Democrats, Spain) commented that there was too little discussion of the guarantees, which Great Britain wants if the euro area states decided to continue their integration. He asked what guarantees could the Union have that British demands will not interfere with the strengthening of the political union. “It is very important to recall what this really means because other countries might want to take a similar stance and what will happen will be freezing of the EU project as it is today. We might even see a form of heading backwards”, said the MEP. Jonathan Faull repeated what the British government has repeatedly stated – that Great Britain had no intention of interfering with the integration of euro area states, but wants guarantees that this will not affect it. Richard Corbett (Socialists and Democrats, Great Britain) made a parallel with the empty chair crisis of the sixties of last century when France, under the leadership of Charles de Gaulle, who was an avid adversary to supranational European decisions and a strong supporter of intergovernmentalism, boycotted Council meetings, for his demands for a political union were not met. The result was the Luxembourg compromise, which instituted the right to veto. It is considered that this compromise brought European integration several steps back. Corbett asked whether the British question was a fitting parallel to this crisis and whether the opportunity is discussed that in the name of satisfying British demands a step backwards was going to be made. There was no clear answer to this question either. The Director of the BRExit task force reminded that the good old European tradition was that every member state, no matter how large, is heard out when it has raised an important issue. “I can confirm that the discussions have been very serious with the British of course but also the level of engagement shown by every other member”. He added that whether other states would decide to follow the British lead is their own decision. The EC will hear out everybody’s problems and will adhere to European law, added Jonathan Faull. The British question will be the first topic on the agenda of the February summit on February 18-19. Second spot is for the refugee crisis, when once again a review will be done of the implementation of commitments. The third topic in the agenda is the approval of the EC’s specific recommendation for the euro area under the European semester.